Oh man, I am excited about this one! Whilst perusing my new farmer’s market last weekend I spotted some locally grown hazelnuts. I somehow talked myself out of getting them with thoughts like “you have a freezer filled with nuts” and “you’re on a budget.” But a week later I woke up and begged John to drive me back to the market so I could get some. I just couldn’t stop thinking about them! And when I am thinking about hazelnuts, I am thinking about nutella, that sweet chocolate hazelnut spread that dreams are made of. I personally think of nutella as culinary crack, but I never buy it because of all the yucky stuff and puffed up oils inside of it. BUT WHAT IF I COULD MAKE MY OWN?!?! And what better way to try than with some locally grown heirloom hazelnuts? 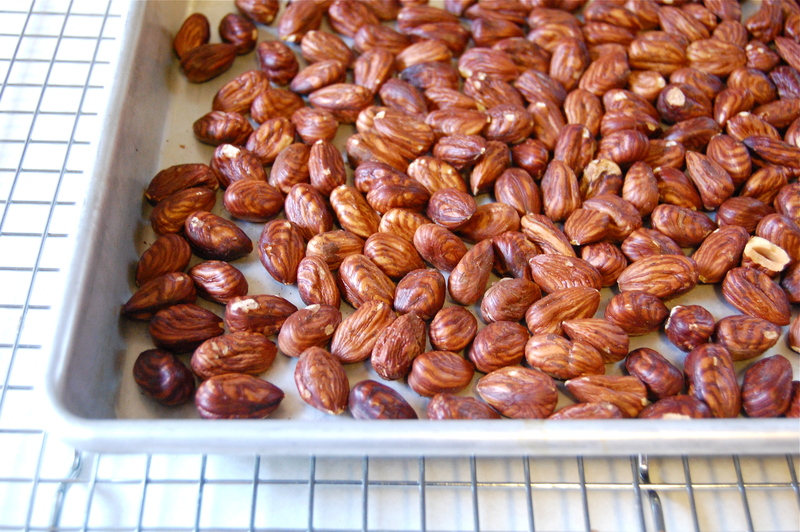 So, first I roasted the hazelnuts, until I could smell them. Then I unsuccessfully attempted to rub their skins off. Either I am not very good at this, or this particular variety is very attached to it’s skin. I gave up and tossed them in the food processor. I blended them for a good 5 minutes, until I had a smooth and liquid butter. Then I mixed in cocoa powder, powdered sugar, salt and vanilla. I blended that for 15 seconds and then drizzled in the canola oil. And there it was. 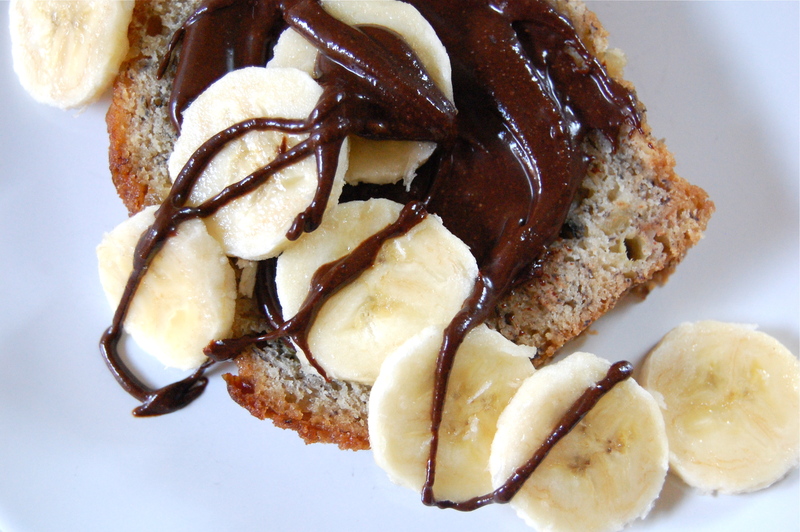 Beautiful nutella. Except it was a tad grainy, since I am not a commercial nut factory. So I strained it, which took some muscle (this stuff is THICK) and I had to call in the reserves. In case anyone’s curious about the actual nuts, I used Duchilly Hazelnuts from Holmquist Hazelnut Orchard. As someone who grew up munching on local pecans, I am a BIG fan of locally sourced tree nuts. So I’m very excited to have found a yummy hazelnut farm, I suspect there will be lots of hazelnut desserts in the near future! – Roast hazelnuts in 375 degree oven for 10 minutes. 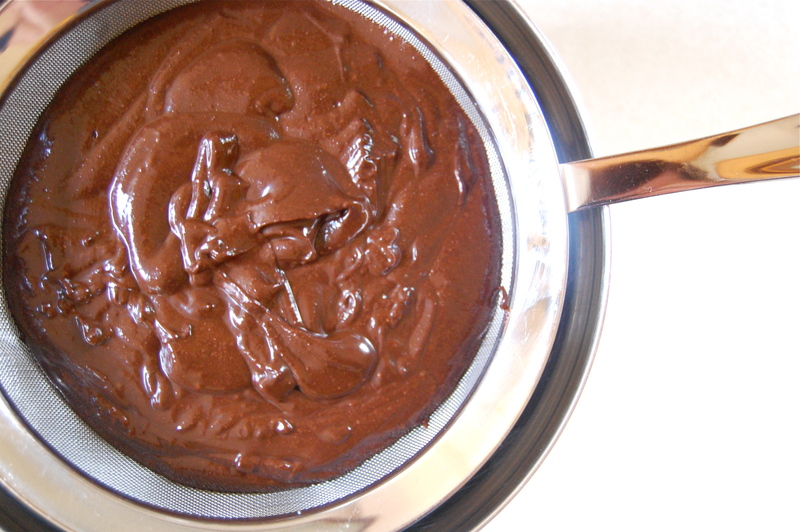 – Put roasted hazelnuts in food processor and puree for 5 minutes, until very smooth. – Add cocoa powder, powdered sugar, salt and vanilla. Puree for 15 seconds and then stream in canola oil. – Strain and spoon into jars. – If you plan on having it around for more than a few days, store it in the refrigerator. Because it thickens when cold, you will need to bring it to room temperature before using. I know, this post is really pushing it. Some of you will forever think I am just plain gross. 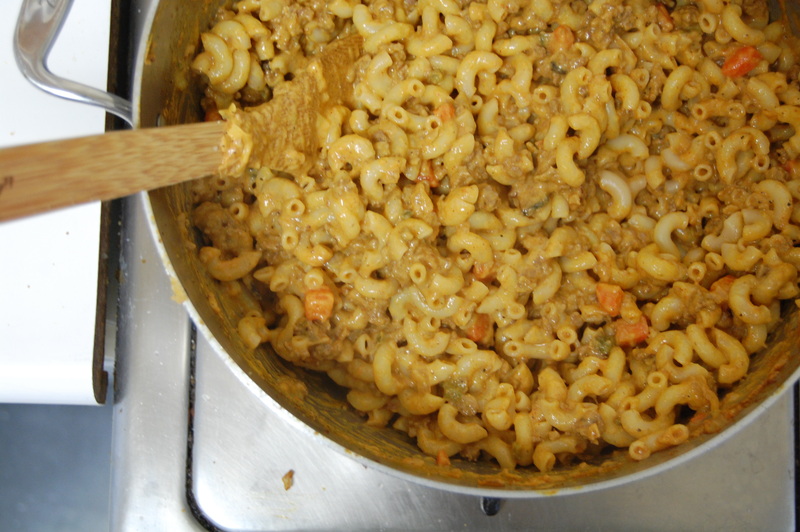 It’s thanksgiving week and I’m posting a recreation of a classic Hamburger Helper dish. What can I say? I’m at home sick (it’s been a week, I’m dying here! ), I’m moving to Seattle in 5 days, I want comfort food and I can’t help it, sometimes I just like to reverse engineer recipes. A year ago the chef at the restaurant I worked at cooked a family meal that smacked of Hamburger Helper, and since then I’ve been obsessed with recreating Cheeseburger Macaroni. But of course I needed to up the game, so I made it Bacon Cheeseburger Macaroni. Well…duh…I think that was an obvious move. Definitely not a date night dish, but great for those nostalgic moments (I can admit it, I grew up in Alabama eating some pretty trashy food). Don’t judge me too harshly. I started by slowly cooking the bacon, to render its fat. I probably cooked it for about 15 minutes on medium low. 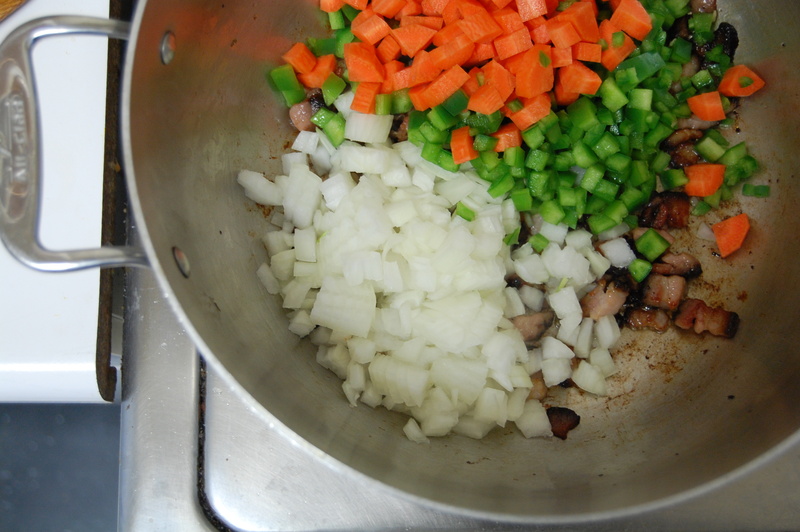 Then I added a diced onion, a carrot, a green bell pepper and a jalapeno. I know technically there weren’t vegetables in the Hamburger Helper version, but come on people, we’re adults now. Kind of. I cooked those on medium until the onions started to turn translucent. Then I threw in 2 minced garlic cloves and cooked it all for a minute more. Then I added some ground beef and chili powder. I cooked it all until the beef was nicely browned. Then I added in tomato sauce, tomato paste and worcestershire sauce. I cooked that for about 10 minutes. Then I added the sour cream and cooked it a few minutes longer. This is the part where it looks seriously unappetizing. But if you can hang in there, it’s worth it. I turned off the heat and stirred in the cooked macaroni and the shredded cheddar cheese. I stirred it for a good while, to melt the cheese into the sauce. Then I added salt and pepper to my liking. And then I ate it. I’m not gonna lie, this recipe makes quite a lot of pasta. Probably enough to feed 6-8 people. But this one time, when I was testing out the recipe, 4 of us ate the entire thing. And then ate an apple pie. Shameful. 12 oz macaroni, cooked and drained. 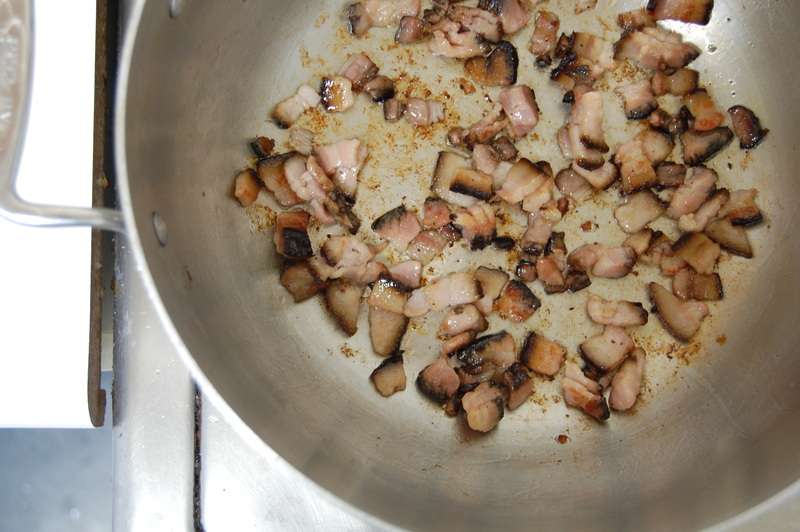 – Cook bacon on medium low heat until it is halfway cooked and releases it’s fat. – Add onions, bell pepper, carrots and jalepeno and cook until onions are translucent. – Add garlic and cook for 1 minute. 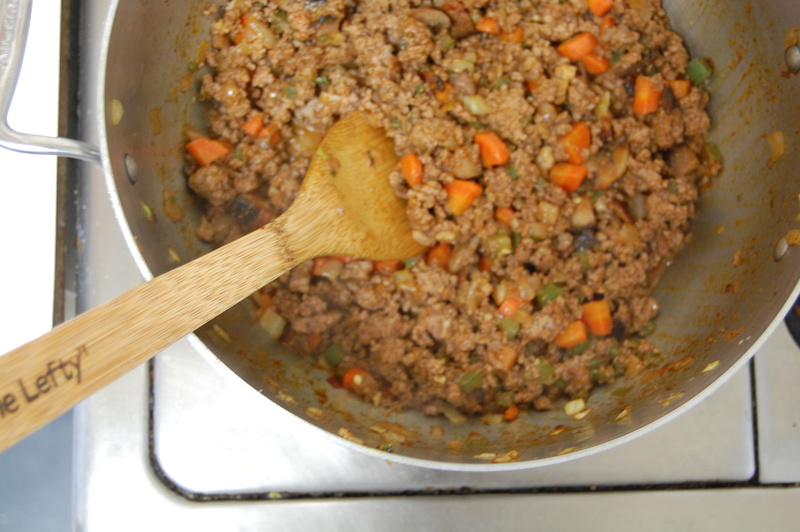 – Add ground beef and chili powder and cook until browned. 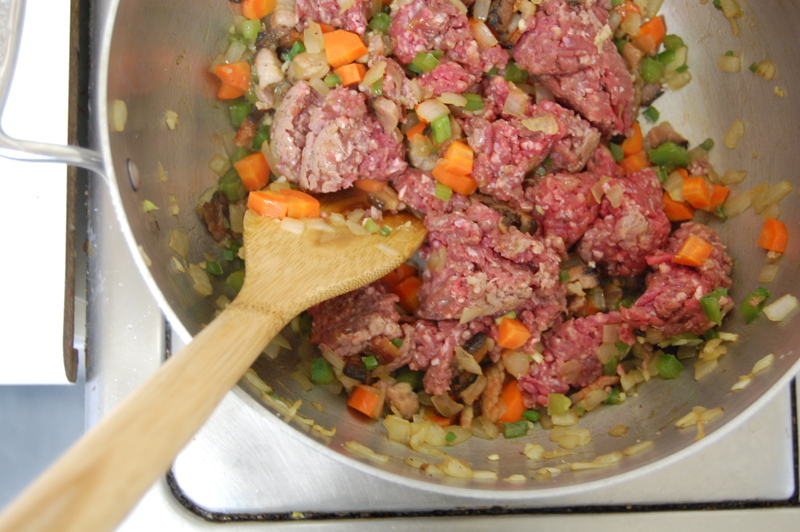 – Add worcestershire, tomato paste, and tomato sauce and cook for 10 minutes. – Add sour cream and cook for 5 minutes. – Add noodles and stir well. – Add cheese and stir well. Things are a bit hectic around here these days. Moving is HAPPENING! We finally signed a lease on the cutest little house in Seattle, so now it’s packing, goodbye party planning, psychotic cooking of everything in the fridge so we don’t have to take it with us while trying to eat our way through a long list of restaurants and debating whether we can actually afford to replace all the furniture that we never liked anyways. And on top of all that, I’m sick with a cold. So what do we need for all of this? ENERGY! 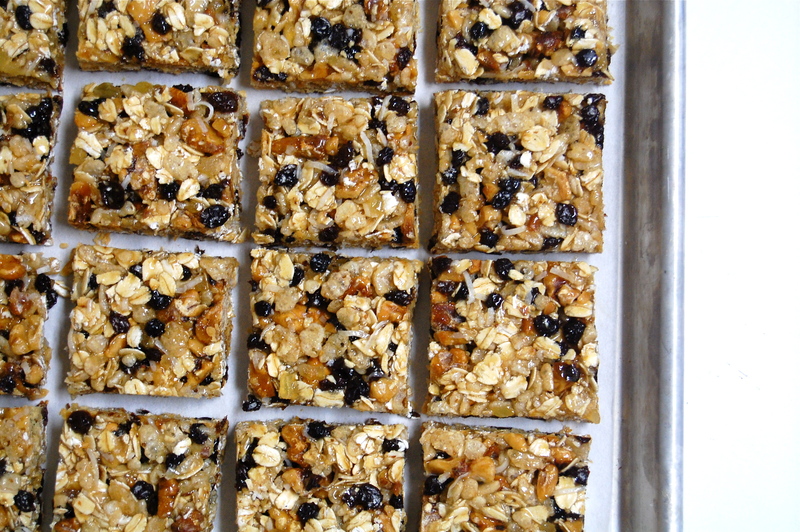 Homemade power bars have been on my list for a while. I actually made them for a hike that never happened, so they came in quite handy all week! Oh yeah, and they’re super easy. I used Heidi Swanson’s recipe from “Super Natural Cooking”, but then adapted it to the ingredients I had on hand. And I added in some maple syrup and upped the salt, because that’s how I roll. 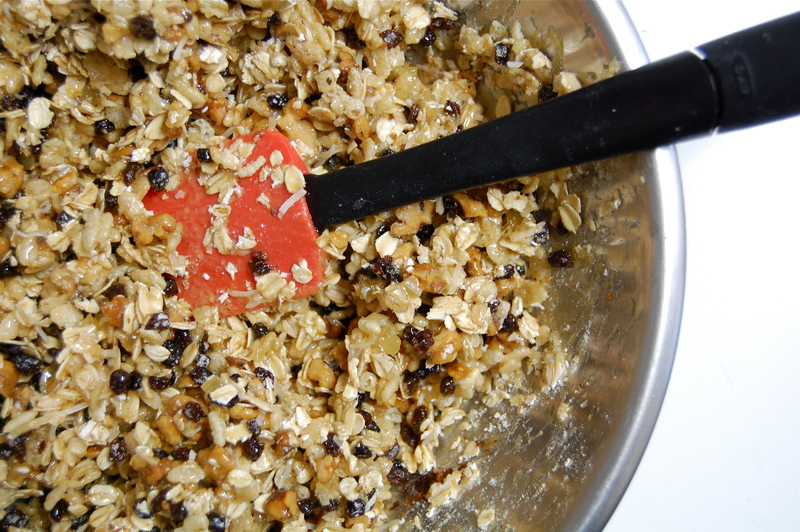 First you throw a bunch of stuff in a bowl: oats, walnuts, flour, cereal, currants, ginger and coconut. Toss them around to coat everything in the flour. Then I put the rest of the ingredients (rice syrup, maple syrup, sugar, vanilla, and salt) in a saucepan and simmered them until they thickened. I poured the hot syrup on top of the oat mixture and stirred it all around to coat. I pressed it into a sheet pan and let it cool down for a few hours. Then I cut them into cute little bars! I have to say, at first bite we were like, “Meh, tastes like popcorn”. But then we just kept eating them and by the end we were convinced they were good. Not really sure what that means. Definitely worth making but I suspect I’ll be changing them up a bit next time. – Grease a pan with the oil. 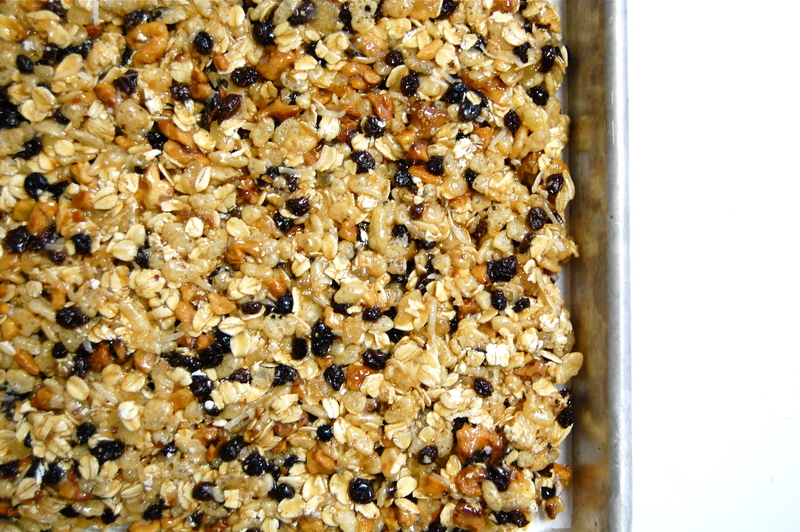 If you like thick power bars, opt for an 8 by 8-inch pan; for thinner bars, use a 9 by 13-inch pan. 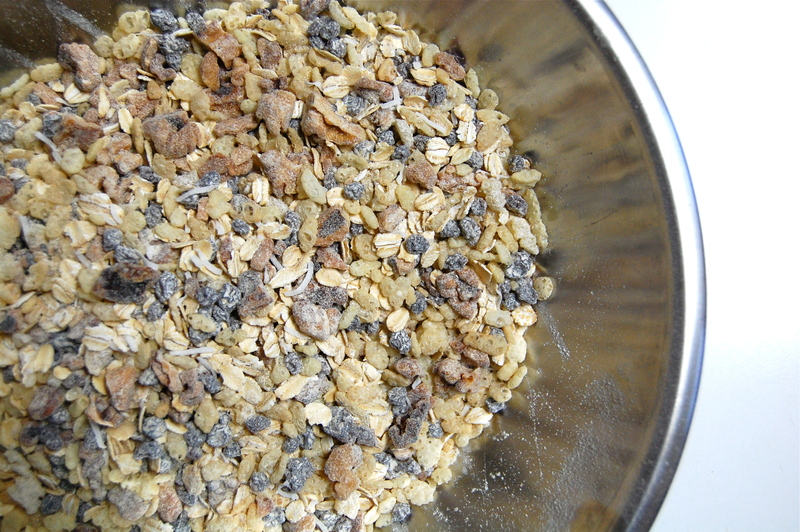 – Mix the oats, walnuts, flour, cereal, currants, ginger and coconut together in a large bowl and set aside. – Combine the rice syrup, sugar, vanilla, and salt in a small saucepan over medium heat and stir constantly as it comes to a boil and thickens just a bit, about 4 minutes. Pour over the oat mixture and stir until the syrup is evenly incorporated. 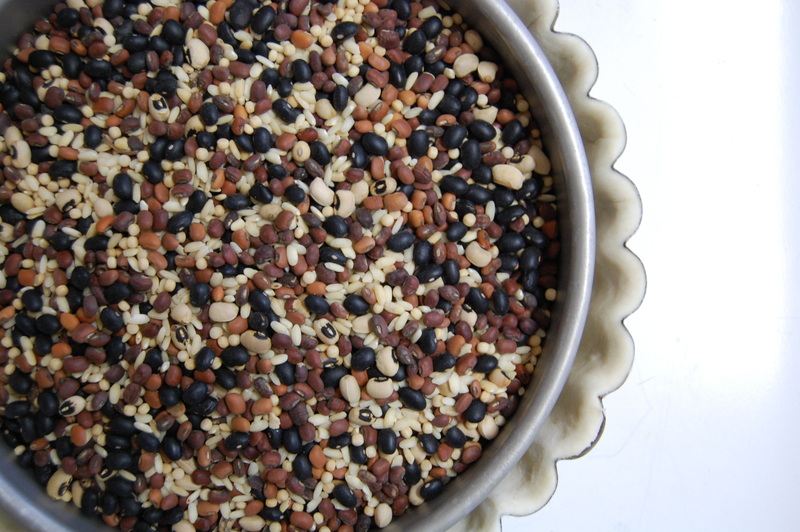 – Spread into the prepared pan and cool to room temperature before cutting into whatever size bars you desire. I know it’s been a little while since my last post. I went on a much needed vacation to Seattle with some girlfriends for a little girl’s weekend. A 5 day weekend, but a weekend non the less. Two of my friends were the architects for the new Delancey pizzeria (if you read the blog Orangette, you’ve probably already heard of it) in the Ballard neighborhood and we were itching to check it out. I’m happy to report the pizza and the restaurant were amazing, as well as the entire city of Seattle, which stole my heart. It was my first time there and hopefully I’ll be returning soon. But back here in San Francisco, it’s Halloween! I actually am not motivated at all this year, so instead of partying with my friends, (I have to get up early and I’m old and lazy! Stop judging me!) I’m making candy corn. I’ve seen this recipe floating around on the web and have been curious, so it was good timing. I started by boiling granulated sugar, corn syrup and butter for about 5-6 minutes. I mixed in some vanilla and let it cool for 15 minutes. While that was cooling, I sifted together powdered sugar, powdered milk and salt in a large bowl. I poured in the warm sugar mixture. I kneaded until it was a smooth dough. Then I split it into 3 parts and mixed in some food coloring. I rolled the dough into thin ropes and pressed the 3 colors together. Then I sliced them into triangles. And then spent an embarrassing amount of time squishing each little piece together. Since I lost steam pretty fast, John came to the rescue. It made a certain amount of sense, since he’s the one that will be feasting on these little sugar bombs for the next week! UPDATE: We’ve had 3 little kiddies visit us for our homemade candy! That alone was worth it! 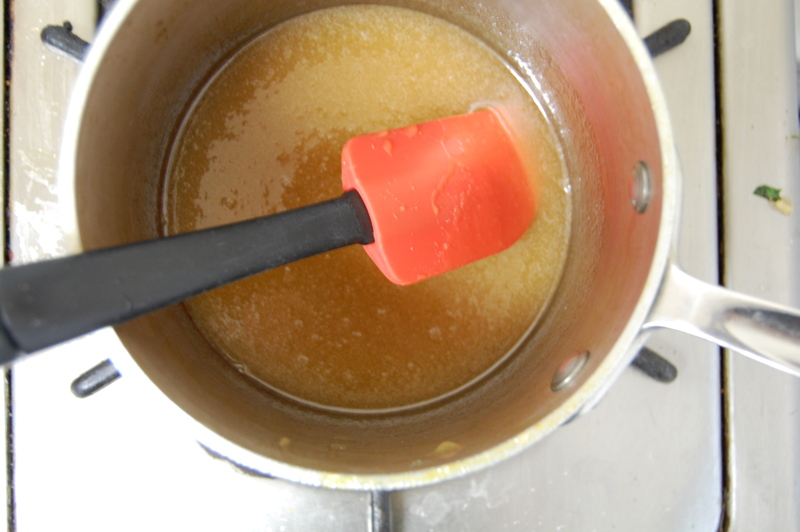 – Heat white sugar, corn syrup and butter in a sauce pan over low heat. Stir until all ingredients are dissolved. Turn heat to high until mixture comes to a boil. Once boiling, reduce heat to medium and let bubble (uncovered) for 5 minutes. – Stir in vanilla extract and remove from heat. Allow to cool until warm to the touch (about 15 minutes). – In a large bowl sift powdered sugar, powdered milk and salt. Add cooled mixture from sauce pan and stir until it’s too thick. Begin to work with your hands and knead the dough until all of the powdered sugar have been absorbed. – Divide dough into 3 sections, make a dent in 2 pieces and add 20 drops of yellow food coloring to each. In one of those, add 9 drops of red food coloring to create orange. Mix each until colors are even throughout. – To make candy corns, eyeball 1/8th of the dough from each piece. Roll each color into long ropes and press together. Cut with a bench scraper or knife and smoosh the seams together. John reported good luck with microwaving them in short bursts to keep the dough warm. Allow the candy to cool and air dry. – Once dry, store in an airtight container. Salt and Pepper Soup Crackers! Seriously, get ready for the cutest little soup crackers ever. So simple, so fast, but totally worthwhile. You start with a basic biscuit dough, but one with very little butter. You can spice them up however you like. On this batch I made salt and pepper crackers, since I didn’t know what kind of soup they were gonna land in. After the dough relaxes for a bit, roll it out to be very thin. Then stamp or cut into whatever your desired shape. I went with the smallest fluted cutter I had, because it’s cute. Use a skewer or a fork (I ripped one of the teeth off of a plastic fork) to poke little holes in the crackers. You want to try to go all the way through, this helps them bake evenly and keeps them from totally ballooning up in the oven. The you brush them with melted butter and sprinkle on some salt. Then you bake them until they’re nice and crispy! And aren’t they frickin’ adorable?! These ended up in a delicious delicata squash soup. I think next I’m gonna play with a spicy version to go in a chili….yummmmm. – Mix in butter by squishing into the flour with your fingers. – Let rest for 1 hour. – Brush with melted butter sprinkle with salt. – Bake at 375 until browned and crispy (9 – 12 minutes, depending on size). I started by pouring my puffed rice in a large bowl. Then I made a sugar syrup. Once it reached 235 on a thermometer, I stirred in some butter. I poured that syrup over the puffed rice and mixed it together. Then I pressed the rice into a buttered pan. While that was cooling I started on the next layer: peanut butter and milk chocolate. I melted them together into gooey bowl of deliciousness. ANd poured that on top of the puffed rice. I spread it out all nice and smooth and popped it into the fridge to firm up. Once that firmed up I melted some chocolate and butter to top it with. I spread that around and put it back in the fridge to set up some more. Then I wait and wait and FINALLY! I get to slice them into cute little bite-size squares! So pretty! And they totally taste like Whatchamacallits! 35 down, 365 to go! 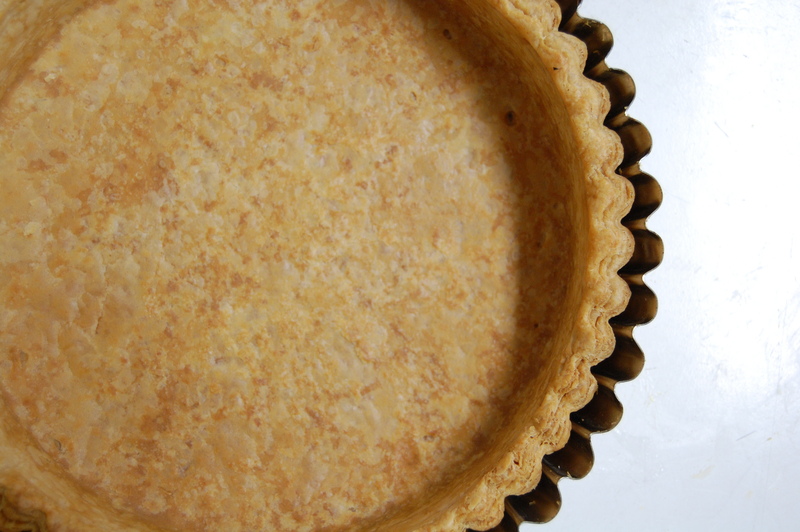 Make the crispy crust: Lightly spray a paper towel with nonstick cooking spray and use it to rub the bottom and sides of an 8-inch square baking pan. Make the milk chocolate peanut butter layer: In a large nonreactive metal bowl, stir together the chocolate and the peanut butter. 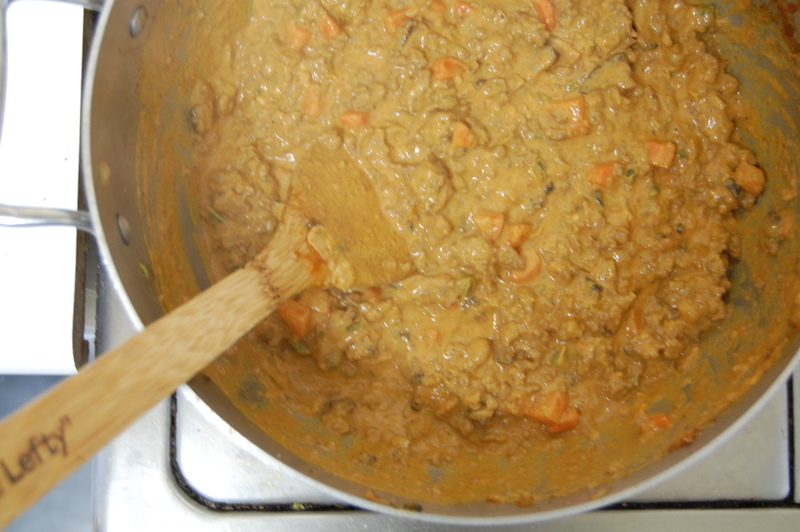 Set the bowl over a saucepan of simmering water and cook, stirring with a rubber spatula, until the mixture is smooth. Remove the bowl from the pan and stir for about 30 seconds to cool slightly. 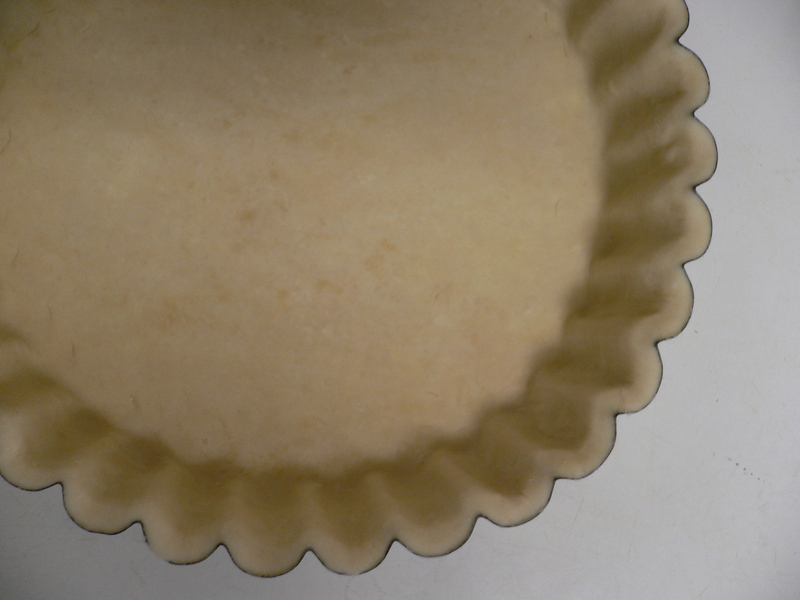 Pour the mixture over the cooled crust. Put the pan in the refridgerator for 1 hour, or until the top layer hardens. 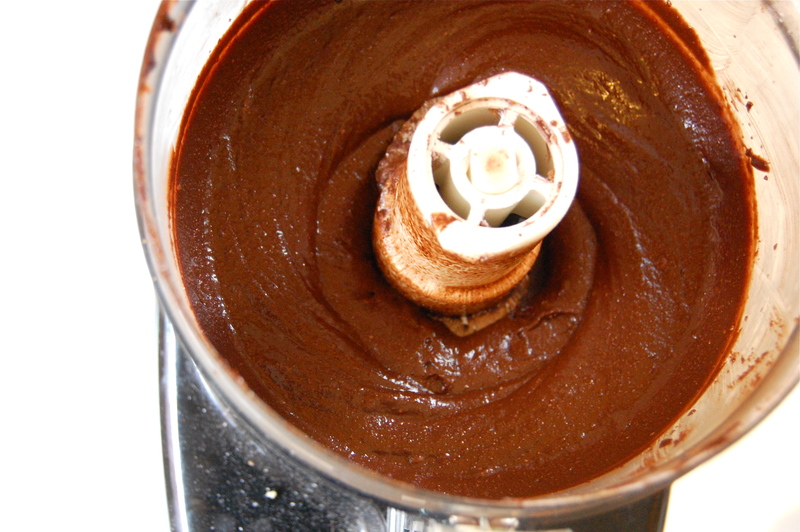 Make the chocolate icing: In a large nonreactive metal bowl, combine the chocolate, corn syrup, and butter. Set the bowl over a saucepan of simmering water and cook, stirring with a rubber spatula, until the mixture is completely smooth. Remove the bowl from the pan and stir for 30 seconds to cool slightly. 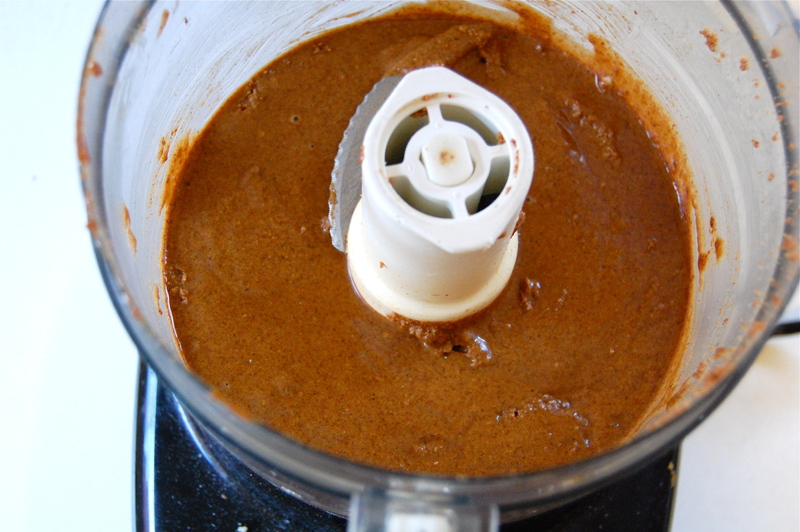 Pour the mixture over the chilled milk chocolate peanut butter layer and spread into an even layer. Put the pan into the refrigerator for 1 hour, or until the topping hardens. Cut into squares and serve. The bars can be stored in the refrigerator, covered tightly, for up to 4 days. This weekend was a lovely one spent up in Napa Valley. My friend Bronson has a house in the woods that he’s been trying to fix up. So this weekend he threw a labor camp party, inviting a bunch of his friends to come up with him and build stuff (fun stuff like concrete foundations!). Not a difficult proposal with a bunch of architects as friends. Since I’m a pipsqueak with some culinary skills, I was hired as camp chef. There was a breakfast of dried cherry scones and homemade granola, a lunch of tuna sandwiches and homemade potato chips, and turkey pot pies for dinner. And lemon poundcake with strawberries and whipped cream for dessert. While that was certainly a big pile of cooking, the part that got me all giddy was the potato chips. Bronson wanted to keep lunch simple, with some sandwiches and chips. When I heard that, all I could think was “Yes! I can make homemade potato chips!” At first he wasn’t too keen on the idea of making them ourselves (What is UP with all the fryer haters? We’re people too! I’ll fry anywhere, anytime. I don’t even need a deep fryer, just a pot. I even travel with my own splatter screen…), thinking it would be too messy. But he was swayed. Potato chips are very simple – you just need 2 ingredients: potatoes and oil. We went with a mix of sweet potatoes and yams. Oh yeah, I guess you need a mandolin too. Mandolins make light work of slicing, and allowed me to get super-thin discs of potato. The trickiest part is getting the temperature of the oil right. We didn’t have a thermometer with us, so it took some trial and error to get to the sweet spot, but I think 350 is about right. Once the oil temperature is set, they only take about 3 minutes to fry! While they were still warm I tossed them with some salt, pepper, cumin and parsley. They were way better than any chip I’ve ever gotten out of a bag. I think they’ll make it into the regular picnic rotation.